Create an onion diagram by dragging and dropping pre-made templates. Various templates to choose and easy to customize. 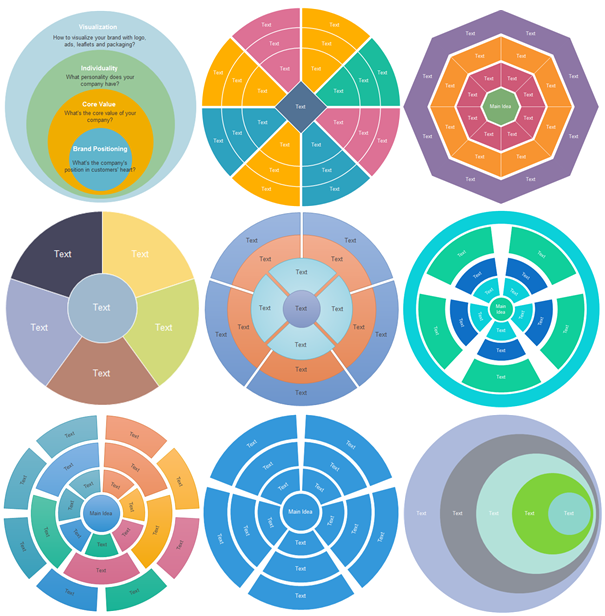 Through the smart Circular templates, you can create onion diagrams of different styles. 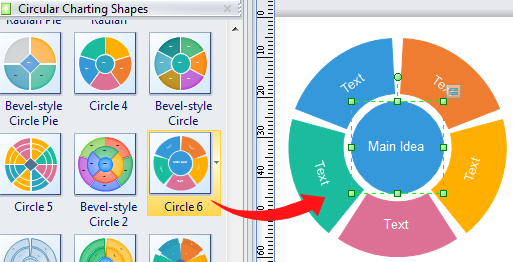 Start Edraw, from the Business Diagram category, double click Circular Diagram. From the opened library drag a template and drop onto the drawing page. Add or delete a ring. Add or delet a segment. Through the Text Block Tool, you can move the default text position or add new text block at the place you want. Edraw offers many fill options and quick styles. Select the whole chart, you can change the whole chart color; select a sub shape, you can change the sub shape color. How to Select a Sub Shape? Click on the chart once, you can select the whole chart. Click on a certain ring twice, you can select this whole ring. Click on a segment three times, you can select the segment. With Edraw you can create onion diagrams with a great diversity of styles and colors.